Is Your Design Wasting Space? Before you show up my front lawn with pitchforks and torches allow me to explain…. How deep were the verticals? I’m guessing at least 20 inches. 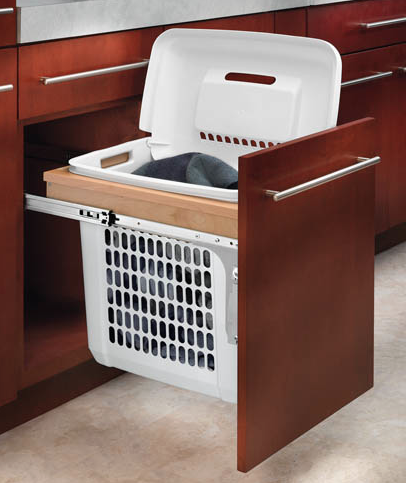 How much space did you allow for the hamper? The 20” deep hampers are all 15” wide. Click to see Rev-A-Shelf’s hamper collection. Do you install the 14” deep double hampers that you use in your closets? 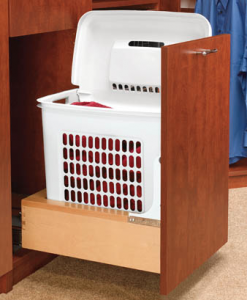 Do you buy a deeper hamper and center it on the shelf, wasting almost 10 inches? Do you make something custom? I am constantly being asked this question and before I tell you what I usually suggest, I would love to hear what the pros do. Comment below or upload a photo to my Facebook page and show off your work.